The Southwest Corridor Park Management Advisory Committee (PMAC) would like to gather your thoughts about potential improvements to two specific garden spaces near Mass. Ave. in the Southwest Corridor Park (SWCP). (1.) The Rose Garden is an enclosed garden with a garden gate entrance near the corner where Wellington Street meets the Southwest Corridor Park. (2.) Northampton Green is the large greenspace in the park between Mass. Ave. station and Northampton Street. THIS SURVEY is designed for anyone who lives, works, eats lunch, walks, bikes, or spends time around these two garden areas. Thank you for participating in this survey! See http://swcpc.org/survey for photos of these gardens. * 2. About how often do you spend time in the Southwest Corridor Park? * 3. How do you usually travel within the Southwest Corridor Park? * 4. How often do you visit the Rose Garden? * 5. What activities do you currently enjoy in the Rose Garden? * 6. How often do you visit the Northampton Green area? * 7. What activities do you currently enjoy in the Northampton Green area? * 8. Would you be interested in any of the following activities? If yes, where? As you may know, the SWCP gardens and landscaping are maintained by volunteers in partnership with DCR, the state parks agency. Volunteers have started brainstorming ideas for these two spaces. Which of the following ideas do you favor? What other ideas could you add? * 10. Remove the hedge around the Rose Garden and replant for greater visibility and visual appeal. * 11. Add game tables (chess, checkers) or a game area to the Rose Garden (such as horseshoes, bocci, etc.) to draw more people into the garden. * 12. Add more lights to the Rose Garden. * 13. Add a pathway in the Rose Garden, with a possible second entrance near the top of the garden. (Not sure of feasibility, but please indicate whether you would favor such a change). * 14. Add new native grasses and native plantings to the Northampton Green area. * 15. Add new plantings to highlight the granite obelisks (poetry/prose installation) in the Northampton Green area. * 16. 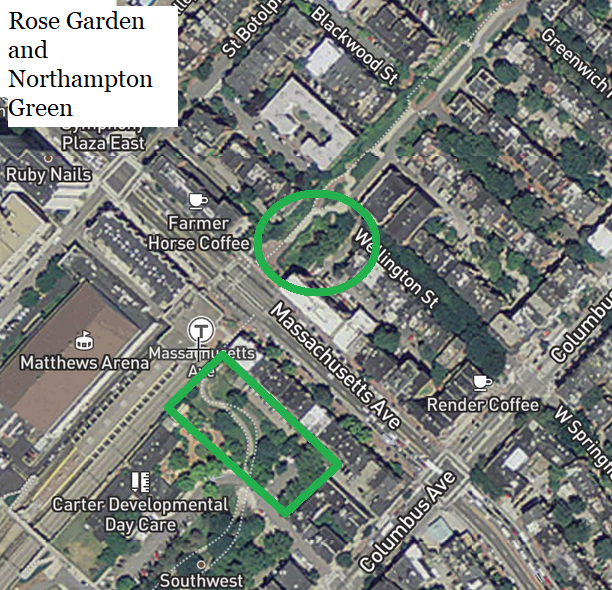 Add public art, stones/rocks, or other non-plant landscape features to the Northampton Green area. * 17. What other ideas and improvements would you suggest for these areas? * 19. If yes, how would you like to be involved? * 20. Stay in touch! After you click DONE you'll see links to sign up for our email list and/or like and follow our Facebook page. Here is my contact information so you can reach out to me about questions or next steps.